If you are looking for a reliable and trustworthy company to maintain your photocopier then Teffont is your ideal choice. Our engineers are some of the most highly skilled in the industry and are capable of working on even the oldest models. We keep an extensive stock of both new and old parts, helping us to repair your photocopier quickly and efficiently. Teffont sets the standard for service, value for money and peace of mind. Teffont’s photocopier maintenance service contract includes all parts, labour and toner. By paying an all inclusive cost-per-copy you can be safe in the knowledge that no matter how much toner, service calls or parts your photocopiers needs, everything is included. 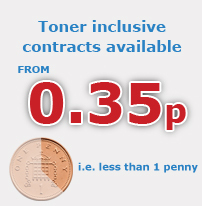 It’s cost effective too, because toner is inclusive you can print safe in the knowledge that each page will cost you the same agreed amount, unlike desktop printers where the cost-per-page rises with the amount of toner that is used. Prevention is better than cure, that’s why we provide routine photocopier maintenance to ensure that your photocopiers are always clean and trouble free. Should an unexpected problem occur you can freephone our friendly service team who’ll direct the nearest engineer to you. Our engineers are experienced, professional and courteous. Arriving within either 4 hours (our premium service) or 8 hours (our standard service) they will quickly and efficiently repair your photocopier as well as provide a free check-up and clean. If your photocopier can’t be repaired onsite we will provide you with a loan photocopier, helping you to continue working as normal while we repair your photocopier in our workshops. Sometimes the largest problem has the simplest solution, that’s why we provide you with our freephone photocopier helpline where our knowledgeable team can help you resolve common issues such as error codes and paper jams. Day-to-day problems can often be resolved by users themselves , all it takes is a little training. As part of our photocopier purchase and maintenance packages we provide you with free photocopier training up to twice a year. Our quarterly service statistics help you keep track of your photocopier’s health, helping you to make decisions on managing and upgrading your photocopiers. Plus, our flexible invoice options make payment easy and convenient for you. Choose Teffont today as your ideal photocopier maintenance company.